My First Otomi Handbag creation! So happy with how it turned out. I have been holding onto this embroidered ribbon for a while! Glad I finally found a special place for it . 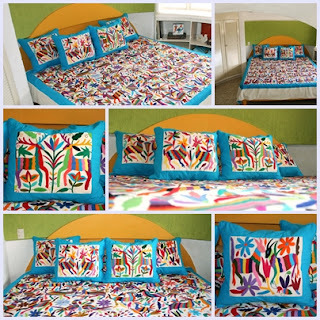 Have you ever wanted an Otomi Coverlet or duvet? we can create your one of a kinda original piece. Click here and You can order a piece. This is for a king sized creation. We can Create matching Shams as well. We have lots of inspirational pieces that can help you decide. We can Trim with accenting colors or a solid one. Whatever you can dream, we can create. Each piece is a unique orginal. Why settle for printed knockoffs when you can get hand created one of a kind pieces directly from the source? Let's go shopping! This is TDF!!! 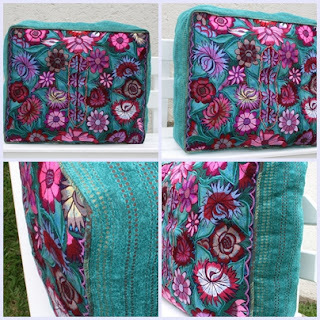 a pouf made from a Shawl from San Cristobal. These are the newest pieces from our San Cristobal, Chiapas Collection. You can check out our Chiapas section here! 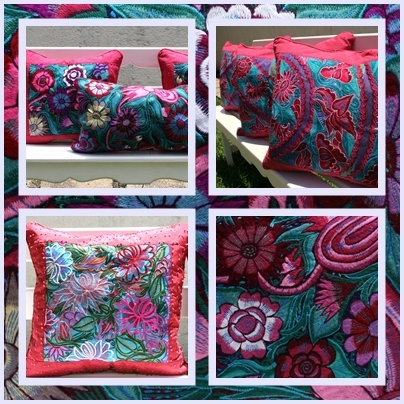 These colorful Pouf/floor cushions are sure to brighten any space up and create a strong focal point. Look closer at the center and you can see the neck entry. We have added other huipil pieces to accent this upcylced piece. 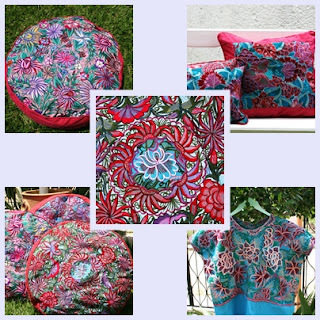 Exquisite embroidering! This sham collection screams Oilily and Look at me! Check them out in our Etsy Store. Aromatherpay massage on a professional table in a spa like clean and tranquil space. Treat yourself! These collectivos/buses really mess with our backs! I know! Abel uses Organic Coconut and Almond Oils. Nothing but the best! Cause we are worth it. Need massage services? Please contact me recyclechic AT Yahoo DOT com Or call 9511559010 ask for Abel! I created a Mosaic of some of the pieces that I have recently created along with some samples of larger textile fabrics. If you love these make sure to check out our online store. For the past two years I have been playing around with Otomi textiles and have gotten more and more comfortable with cutting the really large pieces. These pieces are shy of 2 meters by 2 meters and are such a luxury to have access to. It took me three weeks to cut this piece. I'm pretty happy with how it turned out! But, I have to brag a little...My favorite is my Summer Silk Line! I just love the colors! Oh maybe I have another favorite!! I love making poufs! This one especially. All in all the sky is the limit with these textiles! If there is something that you would like for me to create, I'd be excited to work with you. If you need fabric to create something, I can help you out there as well. 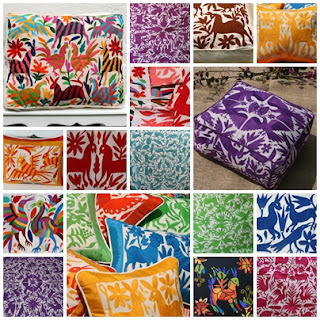 Whatever your Otomi needs are, you can count of us! We have clients in Australia, Japan, USA, London, Europe, and on and on! We have a five star Paypal rating and a 100 feedback on Ebay and on Etsy! Woohoo! We are so excited about our new space. We even have a small guest house attached that we have available to rent out to wanderlust travellers. It has been fun to meet like minded spirits during their journeys. Oaxaca isn't an easy play to find CLEAN and AFFORDABLE accomodations. Trust me, we have lived here long enough to understand the pitfalls of finding decent digs while you are on holiday. Every time I stayed somewhere I would be so disappointed in the quality of the space. Terrible scratchy towels, cheap lumpy matresses etc. I always thought to myself, If I ever had a guest house here I would make sure to bring in high quality linens from the USA etc. Well, I got my chance and here we go. What I LOVE about our space is how refreshingly cool it is. We can be at the heart beat of the center, exhausted from the heat and enter into our little world and immediately feel the coolness. The design of the building is similar to adobe. The thing I like LEAST about our space is that we live next to an event hall. So every Saturday we have to be prepared for your own private serenade. It's really not that bad considering that Oaxaca in general is a very very noisy city. If we like the music...we hang out open up a bottle of wine and relax, if we don't, we head out for a night on the town. No biggie. We keep a fan in the apartment for "white noise." All in all we love our new place here in San Felipe. Somedays we walk to the Llano park which is my favorite park in the historic district and other days we take the bus into the Zocalo. I am happy to be away from the center because it is SOOOO expensive to eat there and after a while the vendors pushing you to buy wears on you. I love being able to drink my coffee without having 10 people try to sell me book markers or jewelry. We are located steps from a really nice Italian Coffee shop. Great Service, great coffee, and CLEAN! You can find us on the map here. I love our little guest house. Lots of fun art within the space and we also have an MP3 docking station for your music needs. Our WIFI is super fast. It allows you to video skype which is hard to come by here in the city. All in all this is our new space. If you are interested in the space or know of anyone please feel free to write us at http://www.sandrarenteria.com/ or you can reach us via AirBNB. Airbnb does charge a commision but if you feel safer going thru a commercial venue here is the link. AirBNB LINK Oh yeah. We accept pets for a small fee. Rates are $35 per night or $214 per week.